You’ve probably heard some news recently about happenings along the border with Mexico. We have! And since we’re only three miles from the border, I thought I’d make a few comments on the subject. The TV news here frequently comments on the influx of people coming in, thousands each week, if I remember correctly. Interestingly, most are not Mexicans although they come through Mexico to get here. Most are from Central America, especially Guatemala, Honduras, and Nicaragua. These people have traveled about 2,000 miles to get here. And they didn’t travel First Class, believe me! I believe they entered not as illegals swimming across the river but as refugees because of the terrible conditions in their countries. As refugees, they are treated differently than those who come illegally. Near Donna, they have built a facility during the last two weeks. It’s designed to care for 500 people for up to three days. It’s a huge tent with a wooden or steel framework. And it went up FAST! They say that the numbers have increased greatly since the election, as the people are concerned that the new administration will make it much more difficult for them to enter the US. There is a section of “the wall” at the nearest point the border is to us. Interestingly, it is not exactly on the border as the border is the middle of the Rio Grand River. It is anywhere from a few yards from the river to a mile or so from the river. Some farmer’s fields are on the “other side” of the wall! TV news showed that they have a key code to punch in to open the huge gates so they can get to their fields. 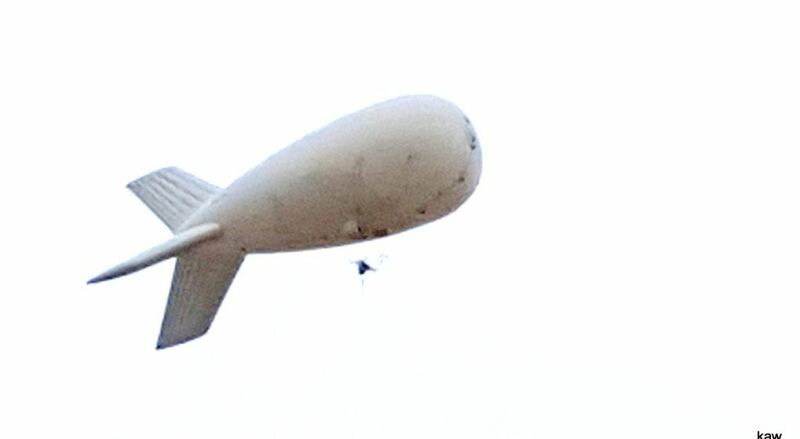 The picture above is of what I call “the blimp.” The proper name is an Aerostat. It is tethered about 5 miles from us and is filled with electronic sensors which allow the officials to keep track of what’s going on for 10-15 miles up and down the border. The altitude was pretty low when this picture was taken, about 400′ I’d guess. The day was overcast, so my guess is that they pulled it down. I think it normally is about 1,000′ in the air. And then there are the boats! I’ve mentioned them before. Both the US Border Patrol and the Texas Highway Patrol have boats which patrol the river. Each has three outboard motors, and each motor is 300 horsepower! That’s about five times the power the airplanes which I fly have! And these boats can really “fly,” too!